"Tell her there's a new bat in town, and I have my name written all over her." If you haven't seen any of Steve Oedekerk's other Thumbation titles (like Thumb Wars or Thumbtanic) then the idea of watching a short comedy populated entirely with thumbs rather than traditional actors might seem a little odd. As with the other Thumbation offerings, these "actors" are fully costumed, and have (ahem) digitally-appended facial features. The effect is surreal and bizarre to say the least, and when paired with Oedekerk's often appropriately juvenile humor makes for a decent way to get a few laughs. Most of his Thumb shorts have been good, with the exception of the painful-to-watch The Blair Thumb, and Bat Thumb rivals Thumb Wars as the best of the lot so far. Each feature runs only about a half hour, and Image has released each of the various titles separately for under ten dollars a piece. As you probably figured from the title, this latest installment lampoons the whole Batman mythos, from the Adam West television series through the gloomy vision of Tim Burton. The opening sequence parodies the beginning of Burton's film shrewdly, and the sets are deceptively elaborate. The humor is often heavily pun-laden, and Oedekerk is not shy about going for (and getting) the cheap laugh. 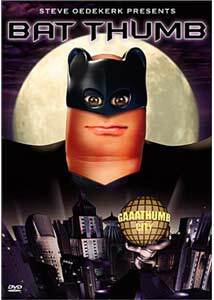 In Bat Thumb, Gaaathumb City has a new villain by the name of No Face (voiced by Rob Paulson), who is quite literally a thumb without a face. Bat Thumb (voiced by Oedekerk) is called into service to put a stop to No Face's crime wave, and he is unwillingly teamed up with the hilariously fey and effeminate Blue Jay (voiced by Paul Greenburg). Vicky Nail (voiced by Jackie Harris) is busy wooing Bat Thumb's alter ego—millionaire Wuce Bane—before she is kidnapped (thumbnapped?) by the dreaded No Face. The jokes on this one are written surprisingly well, and like most of the other titles in the series, are certainly silly, but they rarely fail to elicit a grin at the very least. The character of Blue Jay is easily the funniest one in Bat Thumb, and his rope climbing sequence is really just too damn funny. Image Transfer Review: I've always been pretty impressed with the image transfers for the Thumbation series, and this one is no exception. Colors are particularly bright and crisp on the 1.33:1 fullframe transfer, and the night sequences exhibit deep, natural blacks. The absence of any annoying blemishes and the lack of major compression issues make this production look very clean. Audio Transfer Review: Audio is offered in 2.0 and 5.1 surround, as it was on the previous Thumbation outings. The differences between the two tracks is negligible, but when compared to one another the more robust dynamic range of the 5.1 wins out. Neither track makes use of the rear channels to any degree, and both offer clean, well-mixed dialogue that is perfectly suited to the largely silly content. Extras Review: When it comes to extras, Image really gives you your money's worth on these Thumb titles. As with the previous releases, there is a full-length, scene-specific commentary featuring director of photography Mike Deprez, set decorator Frank Kowal, and production designer Jorg Dubin. Oedekerk does his this time in character as a fictitious director, while the other guys play it straight. Like most of the other commentaries in the series, this one is mostly inane, with the lightweight comments consisting of production anecdotes as if the thumbs were real actors (they aren't, are they?). A lot of inside jokes on this one, but the commentary is easy to listen to, even if it doesn't offer much in the way of substance. Hey, it's only twenty-eight minutes. Three brief deleted scenes run 01m:02s total, and two of those are more of Wuce Bane's drunken thumb butler. The cast interviews (03m:49s), in which the main thumb "actors" discuss their motivations is on par comedically with the feature, and had a couple of laugh out loud moments with the "thug" thumb. The behind-the-scenes segment runs less than a minute (:49s), and is largely forgettable. The disc concludes with a quick storyboard section, 18 chapters and trailers for a number of Thumbation titles. This one is every bit as clever and funny as Thumb Wars, and it deftly parodies both the Tim Burton-era Batman as well as that of the Adam West years. The character of Blue Jay (think a really, really effeminate Robin) is hilarious, and provides the bulk of the laughs. This isn't highbrow comedy by any means, it's just funny stuff nicely packaged by Image.